Here comes the new opportunities for all Indian candidates to grab a Government Jobs in IIT Dharwad on regular basis. IIT Recruitment department is looking to fill up the various NON-Teaching job profiles in IIT Dharwad. 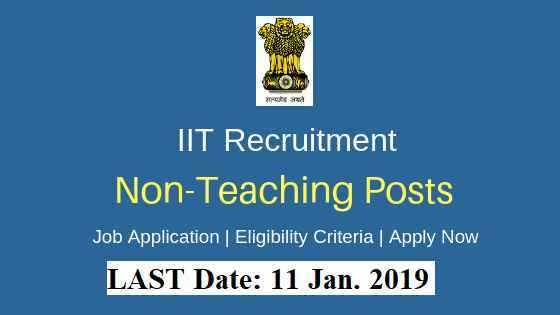 There are total 24 various NON-Teaching job profiles which are going to be filled up through this IIT Recruitment 2019. Introduction About IIT Dharwad: IIT Dharwad is an Institute of National Importance created by an Act of Parliament in 2016. IIT Dharwad has been progressively starting its processes in its present campus while at the same time, master plan development and construction of permanent campus infrastructure are also in development. The IIT Institute has admitted its third batch of students this year. Simultaneously, the Institute is engaging optimistic young and talented faculty and staff members. To provide the Institute’s requirement; IIT Dharwad is looking for dynamic, experienced and qualified professional who can grow in line with the Institute’s exponential growth and create opportunities for growth. IIT Dharwad is inviting online Government job applications from the qualified Indian Nationals for the following Non-Faculty Staff positions on direct recruitment basis. More information which we gather from the official PDF file shared by IIT Recruitment department is given below in this article. We also share the Official Advertisement Link under IMPORTANT LINK section for more detail related to this recruitment process. Candidates possessing the requisite qualification and experience are required to apply ONLY through ONLINE process. The last date for submission of online application is 11 January 2019. Online application form and detailed instructions are available on the WEBSITE of Indian Institute of Technology Dharwad, namely at “www.iitdh.ac.in/announcements_recruitment.php”. Hard copy of the online application form is not required to be sent by the post. 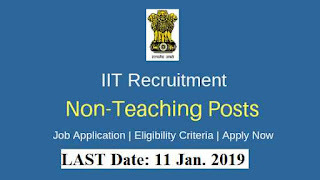 11TH Jan. 2019 is the Last Date to apply.